Starting from version 4, Pilot Poster introduced a free auto comment feature that can be used to bump your Facebook group posts. This article shows how you can set up auto comment on your posts. 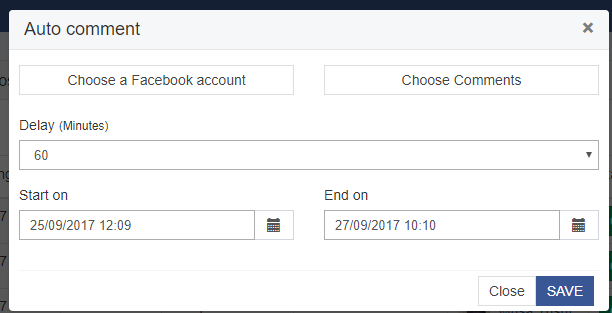 You can only comment on posts published using the schedule function and not posts published using the Send Now option. Also, you can only comment on posts published using Pilot Poster. 1. Create your Comments: The first step requires you to create your comments. To do this, From Main Menu, go-to Auto Comment > New Comment. Create as many comments as you’ll like (Note: Make them as real as possible, so they don’t look like spam). 3. Plan your Schedule: The next screen requires you to plan your schedule. The following options are available when planning your comment schedule. Start & End Date/Time: Set when your comments should start posting and when it should end. On this window, you can see the progress of a commenting schedule, you can Pause, restart and view comment history. 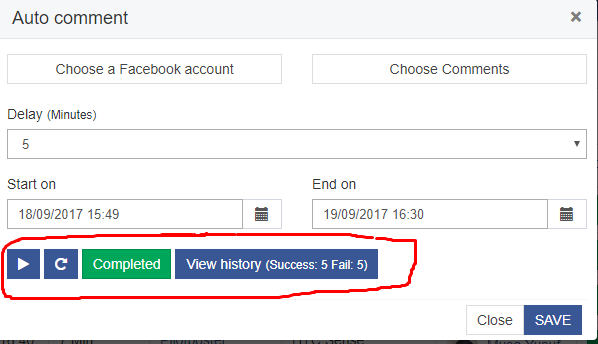 To see the full log, click the View History button. A successful comment will have the View Comment button, which will take you to the published comment on Facebook. While a failed comment will be shown with the error code. 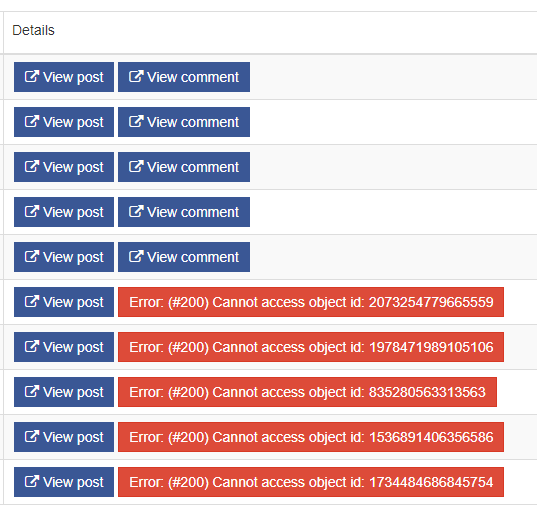 The most common error code is (#200) Cannot Access Object ID which means the user does not have the permission to post comments to the post due to the post still PENDING or REMOVED. 100 posts per day, for all the accounts, or per one? We’ll consider this in future updates. Hello Fadlur, kindly change the app used for posting/commenting. The recommended apps for Scheduling Posts that you’ll be commenting are Facebook for Android and iPhone. Hello, may I know the error you encountered? Kindly confirm if your time zone setting is correct for the schedule to run. If it is correct, please send your username to us via email so we can look into your account. So, using auto comment should I schedule the post to once and auto comment to repeat like everyday? Thanks. Need an article for group joining. That could be risky for your account, except when you post to few groups. We’ll consider it if we receive more requests. Thank you. Thank you for the feedback. Hopefully, we’ll implement this. Facebook already put me in jail for 7 days due to bumping my post manually (not through Pilot Poster). It is not safe to repeat activity rapidly. Carefully select an interval which is safe. We’ll consider this. Thank you. Yup great feature for sure been able to bump our post..
Hello Azam, Auto delete comment will be available in future updates. Thank you. Awesome feature, but since its not for responding on your posts only for bumping it should delete the comment right after it posted it, this will result in your post still being bump you won’t look automated if you want to comment on that post again the next day. 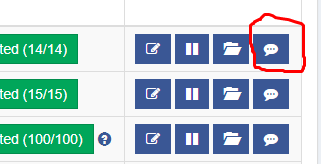 can I schedule the same comment to multiple groups? Any chance to increase 100 auto comment to min 300 or more? Fantastic work btw!! We do not plan increasing it for now so users do not Misuse this feature. Thank you. So this isn’t meant to respond to people’s comments on our posts, just for us to comment on our own posts? You can only comment on your post. The aim is to bump your posts to the top of the group. i’m getting the #200 error but the post is neither “pending” or “deleted”. so far 3 posts with #200 error but i was able to post, the post is still there and none are pending. okay, i just checked from account that i posted from and i have gotten messages that the comments have in fact, posted correctly. i don’t know why it is showing #200 error messages from within my PP account. What error do you get in the comment log for the other comments? Deseo externar mi felicitación para el esfuerzo a éste software, ustedes hacen que éste mundo sea diferente. Esperen mi donación. Muchas gracias. it occurred to me that comments might have to ‘categorized’, as some might be selling products while others might just want comments on images/memes and the like. would it be possible that a Comments Categories be made so we can separate comments so that they correspond to a particular “niche”? Hello Alx, we’ll definitely consider this. Thank you. this looks to be like a great addition to your already awesome software. would it be possible to have it so one can load a .txt file list of created comments to PP? it would really cut down on the time it would take to load 100, 200 etc. comments manually. just a thought.